2/21/19: Just wow! Filming for an upcoming episode of ‘A Haunting’ TV show today. 1/22/19: Gearing up to film an episode for a new paranormal TV show. (This is a different show than referred to below on 1/15/19) It will focus on one of the most dangerous homes where we tried to help a client. 1/15/19: What’s this??? One of our team members has been asked to STAR on a new paranormal TV show! We are waiting for the final word. How cool is that??? 8/6/18: Cal~Para Research featured in the 100th episode of RedMercury podcast! 8/15/17: Yet another producer has moved forward in attempting to use Cal~Para team members on their upcoming shows. Several sizzle reels later we are waiting to hear. 7/14/17: Cal~Para has been asked to be the first investigators at a popular tourist location to help set up Ghost Tours! 6/20/17: Cal~Para is honored to be filmed and interviewed by KMEX Univsion TV channel 34! 6/16/17: We are in the Yucaipa NewsMirror newspaper. 6/21/16: Our producer is back! After the TV network guy was in a car wreck, our show was put on hiatus. We are now back in talks for filming our pilot. If the network never picks it up, it has been a blast. We also appreciate the chance to encourage them to be factual and not hype the field for ‘entertainment’. 6/1/16: Cal~Para asked to educate the public with two seminars; one for teens and one for adults. Check out our event page! 11/18/15: Totally cool! Cal~Para selected to be in documentary filmed at haunted location. The spirits really acted up (on cue?)!!! 10/20/15: Cal~Para Research in talks with local college AV dept for upcoming documentary about the paranormal. 3/13/15: Thank you to KFON TV news for covering our community service event! 11/9/14: Met with a producer to talk about featuring our group in a new paranormal TV show. Film-test is on 11/22/14! 9/28/14: The article is out! Check out the October edition of the Inland Empire Magazine – page 44! 9/19/14: Another request from a college student to be their focus of the paranormal field. We are honored to be selected to help inform the general public! 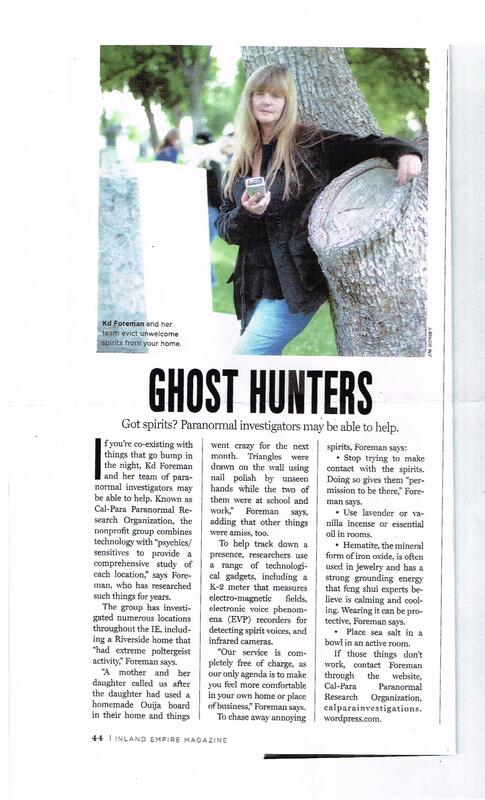 7/24/14: Cal~Para was contacted by a southern CA magazine to be in their Halloween issue – huzzah! 7/17/14: IT’S DONE and it’s in our hands!! Our new promo commercial is cute, short, and funny! Will be premiering it on Saturday, 7/26/14, at the Graber Con paranormal conference! We will be guest speakers from 2-2:30pm – come hear important info! 10/16/13: It’s here! Cal~Para Research featured in October ‘Halloween’ issue of the 909 Magazine: Thanks to team members Rayna, Sue, John, and Alfred for your awesome research! 10/3/13: Cal~Para was interviewed by IE Weekly Magazine! Look for the Halloween article coming out this month! 8/13/13: Cal~Para has been interviewed for a possible Halloween article. Will keep you all updated if it’s published. 5/13/13: Cal~Para is in talks to star in a short paranormal clip! 3/23/13: Cal~Para was contacted for academic research. Thanks for the opportunity to dispel myths and provide accuracy to the general public!! 1/5/13: Cal~Para is pleased to report that our group has been chosen to collaborate with a So-Cal author for an upcoming paranormal book! 10/20/10: Cal~Para members interviewed by ABC News for local haunting.